St. Martin's Griffin, 9781250096678, 432pp. The world was stunned when eighty-year old Cornelius Gurlitt became an international media superstar in November 2013 on the discovery of over 1,400 artworks in his 1,076 square-foot Munich apartment, valued at around $1.35 billion. Gurlitt became known as a man who never was - he didn't have a bank account, never paid tax, never received social security. He simply did not exist. He had been hard-wired into a life of shadows and secrecy by his own father long before he had inherited his art collection built on the spoliation of museums and Jews during Hitler's Third Reich. The ensuing media frenzy unleashed international calls for restitution, unsettled international relations, and rocked the art world. Susan Ronald reveals in this stranger-than-fiction-tale how Hildebrand Gurlitt succeeded in looting in the name of the Third Reich, duping the Monuments Men and the Nazis alike. As an "official dealer" for Hitler and Goebbels, Hildebrand Gurlitt became one of the Third Reich's most prolific art looters. Yet he stole from Hitler too, allegedly to save modern art. 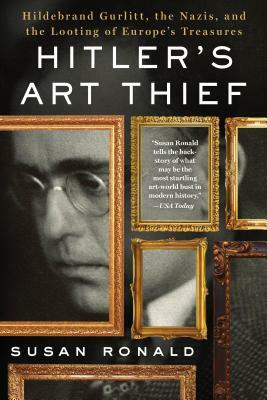 Hitler's Art Thief is the untold story of Hildebrand Gurlitt, who stole more than art-he stole lives, too.